We update our WCA Fundamental Conditions Index this week and forecast a period of moderation ahead. The Federal Reserve (Fed) delivered their third rate increase since 2015 last week. The increase in the federal funds target rate and rate paid on excess bank reserves was widely expected, however. Months of improving employment and inflation readings paved the way for the hike. Fed Chair Janet Yellen downplayed concerns over rising asset prices, full employment, and the size of the Fed’s balance sheet. Markets took the tone of the announcement as mostly dovish, or at least consistent with the existing narrative. Stocks initially rose and bonds initially fell following the release, before reversing those moves later in the week. There was little new learned last week that was not already anticipated by markets in other words. What is new, however, is the data we are getting from businesses. 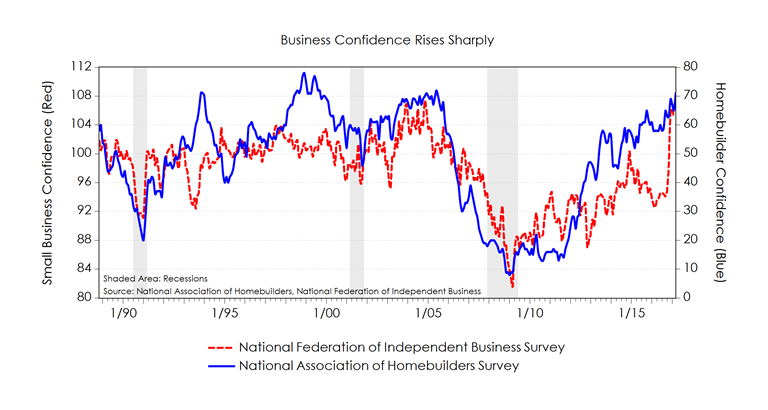 Much overlooked last week were two surveys of business confidence — the NFIB Small Business Survey and the NAHB Homebuilders Survey. Both of these surveys are near cycle highs and the small business survey is much higher than it was in October (chart below). 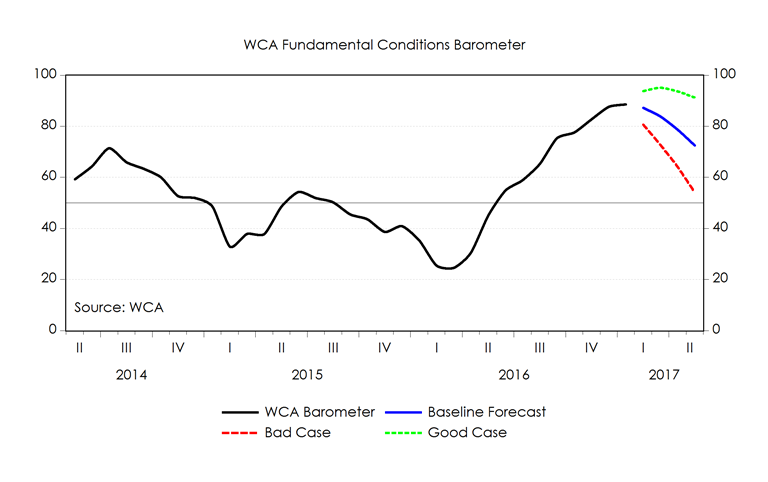 Increased business confidence mirrors the broader improvement in our WCA Fundamental Conditions Barometer (below). Our recently updated forecast of the barometer envisions some moderation in the months ahead, as we expect the surge in confidence to calm from here. Simply put, the pace of improvement seen in the last few months is welcome, but not sustainable at the current pace. Our forecast path for the WCA Fundamental Conditions Barometer, therefore, envisions a more modest pace near-term growth from here. If we are right about this forecast, the Federal Reserve may well be justified in maintaining their very slow and cautious approach to policy normalization.